Ostashevsky is himself an accomplished translator of Russian, but it is his original American poetry that seems ready-made to discuss the the multiple mutating filters of translation, or, to paraphrase Nabokov, the re-Englishing of Russian re-versions of an English re-telling of a Russian memory. His poetry’s battery of English sound effects—which generate surprise even from the most potentially cringe-inducing end rhymes—seem to retain with them a Russian bemusement at unnoted or ignored English assonances, while at the same time perhaps attempting to restore the “bad rhyme” principles of Alexander Vvedensky, a forgotten Russian poet who he’s translated. And the cross-cultural pollination extends to high and low culture, with signifiers of intellectual, philosophical, and mathematical erudition remolded into American vernacular idioms like rap, Dr. Seussisms, borscht-belt comedy and elephant jokes. Appropriately enough, the epigram that heads the collection Iterature, in his poem “Autobiography”—“structaque sunt nostris barbara verba modis”—is a plaint written by Ovid about his attempts (no longer extant) to write in Getic (the language of his place of exile, corresponding with present day Romania, but which may have more generalized affiliations with the “gothic”—a productive engine of translational oddities, as we’ll see in future posts.) The longer quote reads something like “What shame, that I write this little book in a Gothic tongue! What barbarous words have been built into our style!” Metamorphosis, exile, drift . . . the translational gothic creates not merely new texts, but also new beings in process, who are untranslatable, or at least untranslatable back to their origins. The Pirate Who Does Not Know the Value of Pi starts with an absurdist syllogism regarding the difference between “pirate” and “parrot,” although we’ll see the two become indistinguishable—especially in Timerman’s images which reconstruct fractured assemblages of parrotness and pirateness. We know that pirate and parrot are already, at least in their most archetypical manifestation, in a kind of symbiotic relation—that parrot, in its mimickry is always becoming-pirate, and that the “pirate” in his contemporary manifestation as “digital copier” is a kind of parrot of peer-to-peer. Both engage in forms of copying that are without or beyond commercial “value” (or pi, or any other numeric or mathematical system. If anything, the pirate’s “ship describes a Markov chain”—a random process). Nevertheless, there is a type of exchange displayed in this chapbook, a commerce between signs that is not explicitly pinnable or parrotable. Again, while this book is not a “translation” strictly conceived, it is engaging in all manner of translational themes and deformations. 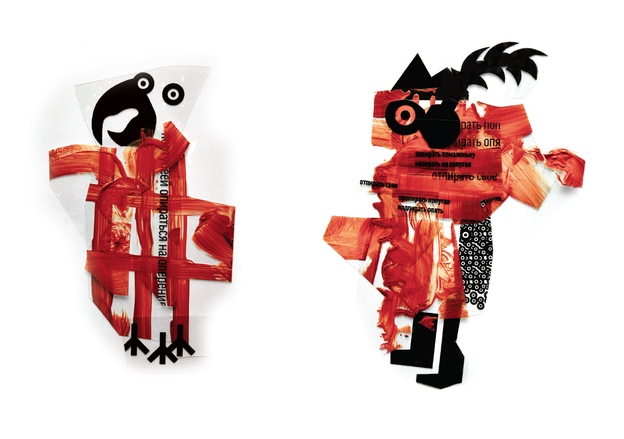 Perhaps most interesting is that embedded in Timerman’s images of pirate and parrot—composed of broken, painted, and scanned pieces of glass—are fragments of Russian language, inextricable from the transformation into English. Mirroring these fragments, seemingly random bolded letters in Ostachevsky’s text turn out to be the Roman cognates of their Cyrillic doubles, so that one can make out, but not strictly decode a sense of Russian caught up in the matrix of pirating-parroting. It seems like a visualization of George Steiner’s notion that “We must not trust the translation whose words are entirely ‘unbroken.’” The ultimate “untranslatability” of these glyphs, I think, works as does a virtual white-space for meaning to emerge, pointing to its possibility, while not articulating it. Since there are no page numbers for this chapbook, I would suggest going to the center of the book, up to the very teeth of the staples to read Ostachevsky’s reflection on both the impossibility and necessity of communicating one’s sensory world. Existence is a kind of “fortress ineffable” and infinite. It must be cut or broken to make meaning, but meaning is not the message here . . . or if it is, it’s where the broken edges leave off and mental space begins.